Entering the offseason, the San Diego Padres — who last won over 77 games in 2010, and won 66 games in 2018 — were supposed to be at least a year or two away from contention. But Padres general manager A.J. Preller has decided they’re going for it right now. Adding Machado immediately made the Padres four+ wins better on paper (projection systems ZiPS and Steamer both have Machado for 5.4 WAR, and the Padres’ third base situation looked brutal before the addition). That addition, plus the Padres’ elite farm system, made it easy to see how the Padres could at least be competitive in 2019. And the Padres made another series of moves on Tuesday to further accelerate their path to contention. 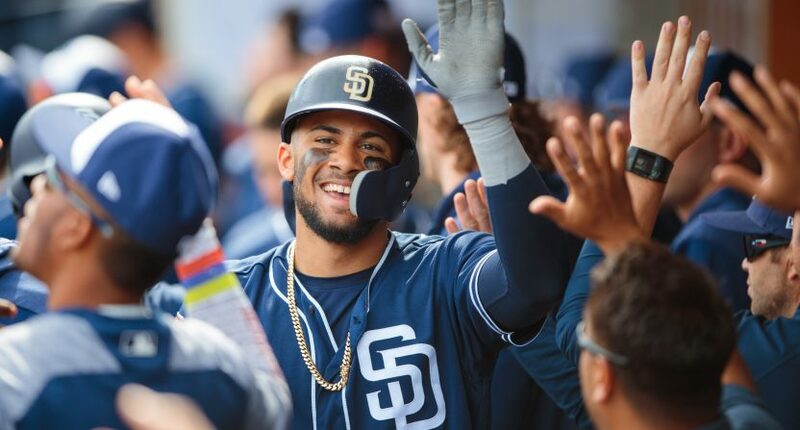 According to several reports, super prospect Fernando Tatis Jr. has made the Padres’ Opening Day roster. This is a pretty shocking development; it was fully expected that the Padres would hold Tatis down in the minors to start the season, to manipulate his service time. Instead, the Padres have decided to just call up Tatis immediately, along with two more highly regarded prospects in pitcher Chris Paddack and catcher Francisco Mejia. Chris Paddack with another spotted fastball to catch Jesus Aguilar looking for his 2nd strikeout of the game. Scouting report: "He taps into his power better from the left side." These moves — which should be applauded by all baseball fans in an era where service time manipulation is frequent — are a clear statement from the organization that they want to win right now. And these talented young players can definitely help make that happen. That’s particularly the case with Tatis, of course. The 20-year-old (he doesn’t turn 21 until next January) is a consensus top-three prospect in baseball, and is the No. 2 prospect — behind only Vladimir Guerrero Jr. — in the eyes of most evaluators. The 6’3″, 185-pounder is a tremendous all-around talent that plays a premium position at shortstop, and has a very exciting bat which likely has more power coming — he already has quite a bit — as he fills out. And Tatis — like Machado — is a very *fun* player to watch. Just use his his wild adventures on the basepaths last Friday as evidence. Everything about his game — the talent at shortstop and offensively, the baserunning, the *fun*, etc — has that Javy Baez feel to it. With players like Tatis, Machado, Mejia, Paddack, Luis Urias (21; top-30 prospect in MLB), Franmil Reyes (23; huge power), and Joey Lucchesi (25; 10.04 K/9 in 130 innings last year), the Padres enter the 2019 season as one of the most fun teams to watch. That’s remarkable when you consider how awful and extremely boring they’ve been for several years. Machado, Tatis, Franmil, Paddack, Urias … the Padres are going to be crazy fun. So, we’ve established they’re fun, and improved. But just how improved? Can the Padres actually contend for a playoff spot? Well, they should at least be able to hang in NL Wild Card race for most of the year, and they have probably near a coin-flip chance of being a .500+ team. Right now, FanGraphs has the Padres going 79-83, but those projections are also being very cautious on some of the Padres’ young talent. Tatis, for example, is projected for only 1.3 WAR. Let’s say he’s immediately very good (which is quite possible)- that would add a few more wins to the Padres’ record. There’s plenty of room for growth and exceeding expectations when you have this much young talent. The main issue for the Padres is their starting rotation on paper, and at this point, it would certainly make sense for them to just go all-in and sign Dallas Keuchel. The Padres are projected 10.0 WAR for their starting rotation in 2019, which ranks 17th in baseball. Adding Dallas Keuchel would put them firmly in the top half. If they are going for it this year, I think he'd be a great fit. There’s also the fact that all but maybe three teams in the National League — the Miami Marlins, San Francisco Giants, and Arizona Diamondbacks — look competitive on paper. So it’s likely to be a crowded NL playoff picture, and odds are that a couple teams — like the Milwaukee Brewers and Colorado Rockies last season — greatly exceed expectations to push the NL Wild Card (necessary wins) territory above the mid-80s. One area that the Padres can benefit from is a weaker NL West. The Diamondbacks got much worse on paper (traded Paul Goldschmidt, and let A.J. Pollock and Patrick Corbin walk). The San Francisco Giants are old and probably the worst NL team not named the Marlins. And the Rockies — currently projected for 81 wins on FanGraphs — are a prime candidate for regression. The Dodgers — projected for 93 wins on FanGraphs — are probably still the team to beat in the NL, but they don’t look quite as juggernaut-esque this time around either. It’s easy to see the Padres being the second-best team in the division, and they have a very realistic opportunity to put together a very good record against these teams. So, the Padres are without question very fun, and there’s a path for them to be a playoff contender immediately. At the very least, they should be competitive in 2019, and a serious contender in 2020+. This team is coming, and perhaps sooner than anybody anticipated after their aggressive roster moves.